We've received a great infographic to share with you from TheBestColleges.org! Starting out at college is a time of excitement, anticipation, and oftentimes, extreme nervousness. There are a whole host of prospects that can leave any freshman filled with anxiety, from making friends to maintaining good grades to knowing which classes to take. One of the biggest sources of anxiety for students, however, is unrelated to academics: A large percentage of students greatly fear the famous and dreaded freshman 15. The truth is, this isn’t an irrational fear: Most college students will gain between 15 and 25 pounds by the end of their sophomore year. One of the main causes of the freshman 15? Lack of exercise: Not only do the majority of college students not get the recommended amount of exercise, one in three just don’t exercise at all. To be fair, finding time for exercise in the midst of busy college life can be challenging, but there are some great ways that that particular hurdle can be side-stepped. 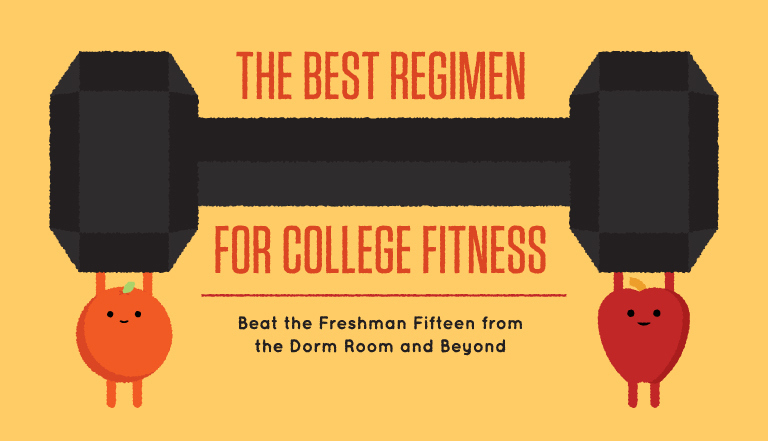 Today’s infographic takes a look at the best ways for college students to stay fit—even in the middle of a dorm room. From cardio to strength training to flexibility, there’s a myriad of ways in which even the biggest of couch potatoes can beat the freshman 15.